From the intersection of US Highway 90 and Washington Avenue at Ocean Springs, go easterly 4.25 miles to Handshaw Road. Turn right [south] on Handshaw Road and go .87 miles to Government Street [Old Spanish Trail]. Turn right [west] and go .13 miles to Beach View Drive at the entrance to Gulf Park Estates Subdivision. Turn left [south] and go 1.8 miles on Beach View Drive to Pointe-aux-Chenes Drive. Turn right [west] and go .9 miles to a dirt road on the south side of Pointe-aux-Chenes Drive. Turn left [south] and go about one block. 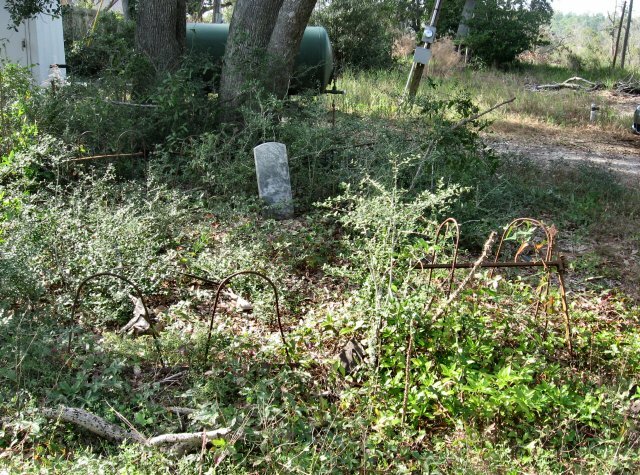 The Indian Mound Cemetery is on the left [east] in the yard of a home on private property. The History of Jackson County, Mississippi, (Jackson County Genealogical Society: Pascagoula, Mississippi-1989). Requiem, Jackson County, Mississippi Cemetery Records, Vol. 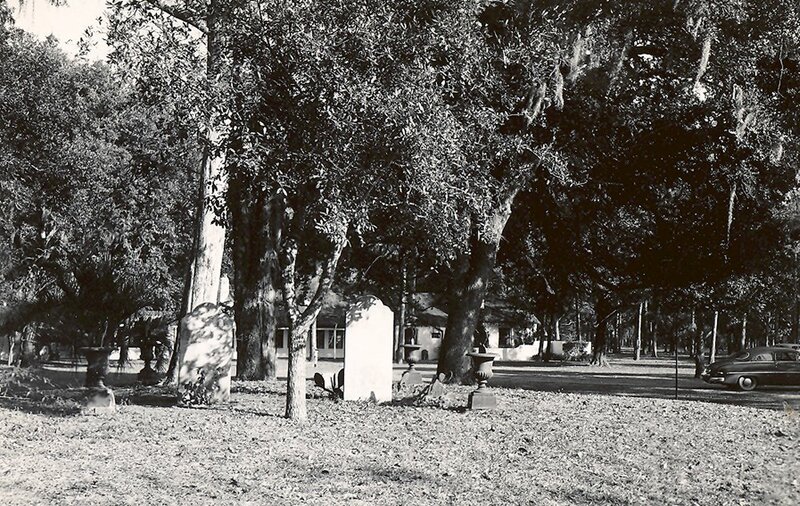 1, “Indian Mound”, (Jackson County Geneaolgical Society: Pascagoula, Mississippi-1969). LOCATION: Gulf Park Estates Subdivision Block 161 in the NE/4 of the SW/4 of the SW/4 of Section 1, T8S-R8W. DIRECTIONS: From the intersection of US 90 and Washington Avenue at Ocean Springs, Mississippi go approximately 6.5 miles east to Mississippi Highway 57. At this junction, turn right (south) on Mississippi. Highway 57, and go 0.28 miles to the Old Spanish Trail (Old US 90). Turn right (west) and go 0.12 miles to Hamill Farm Road. Go left (south) for one mile on the Hamill Farm Road to the Fontainebleau Road. Turn right (west) and go 0.87 miles to the-Pointe aux Chenes Road. Turn left (south) on to Pointe aux Chenes Road and go O.38 miles to East Edgewater Drive. Go right (west) on this road 0.34 miles to 8025 East Edgewater Drive, the residence of James Hargis. The George Family Cemetery is at .the southwest corner of the James Hargis lot on the south side of the road. HISTORY: In 1881, Simeon George (1856-1920), a native of New Americus, Jackson County, Mississippi, bought 300 acres of land in Section 1; TSS R8W from the heirs of Daniel Huey Ramsay (1814-1867). The parents of Simeon George were Reuben Turner George (1810-1900) who was born at Alabama and Cassandra George (b. 1813), a Mississippi native. Circa 1874, Simeon George had married Eunice A. Ramsay (1854-1888), the daughter of Daniel H. Ramsay (1814-1867) and Mahala Holder (1814-1885). They farmed and reared a large family in the Belle Fontaine area: Sardin George (I875-1945) m. Augustine Garec (1883-1945); Herbert George (1879-1910+); Daisy George married Mr. Bilbo (1883-1937+); and Ethel George (1886-1977) married Charles DeJean (1882-1961). Anecdotal history from Elvin O. Ramsay (1907-2000), who was born on the old Simeon George homestead, relates that Eunice A. Ramsay was blind, but, could still perform her domestic chores without assistance. After her demise in 1888, her corporal remains were interred in the family burial plot north of the George home. 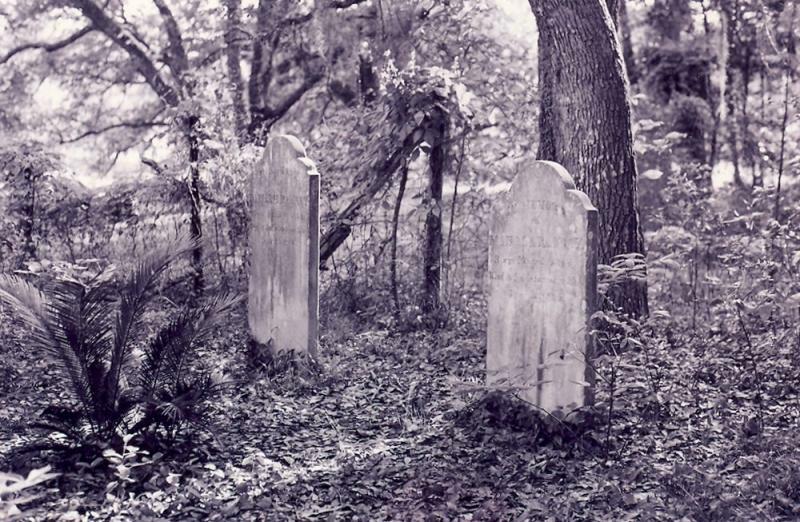 As a child, Mrs. Elvin Ramsay was told that several children were also interred here. 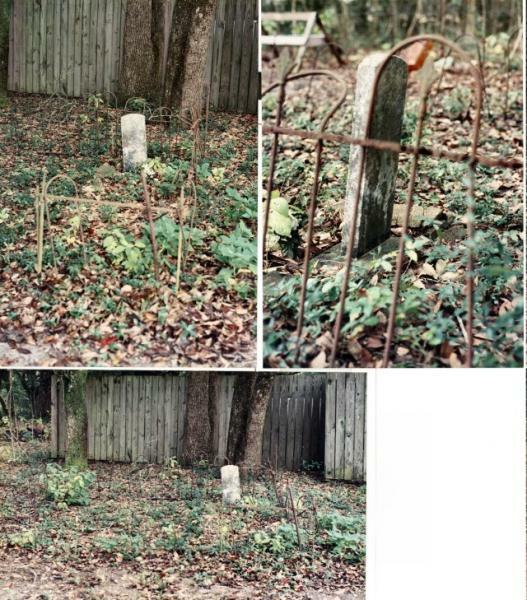 From what remains of the George Family Cemetery today, it appears that the original plot was a 10-foot square surrounded by an ornate fence. 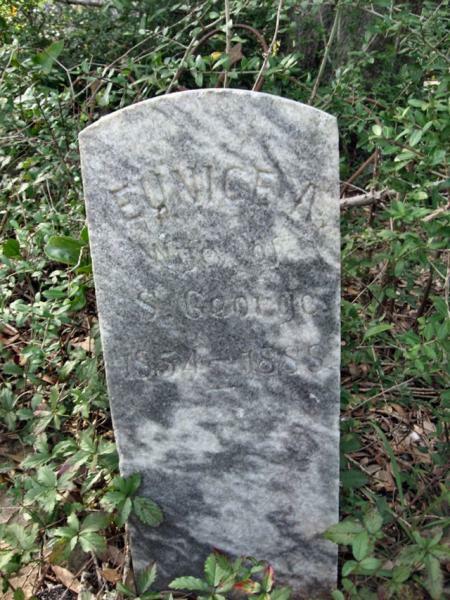 The only tombstone visible is that of Mrs. Eunice A. George. It is made of marble. On December 6, 1890, several years after the death of his wife, Simeon George married Maggie Robbins (1872-1903+). They had two children: Calvin George (1894-1918) and Edward George (1895-1964). Simeon George served on the Jackson County Board of Supervisors representing the' people of Beat Four from 1896 to 1904. In October 1893, he gave one acre of his land to W.R. Bilbo (1859-1927), John G. Webb and Sardin George, the Trustees of the Belle Fountain School, to erect a school house upon. The school was located in the southeast corner of the NE/4 of the NE/4 of Section 1, T8S-R8W. 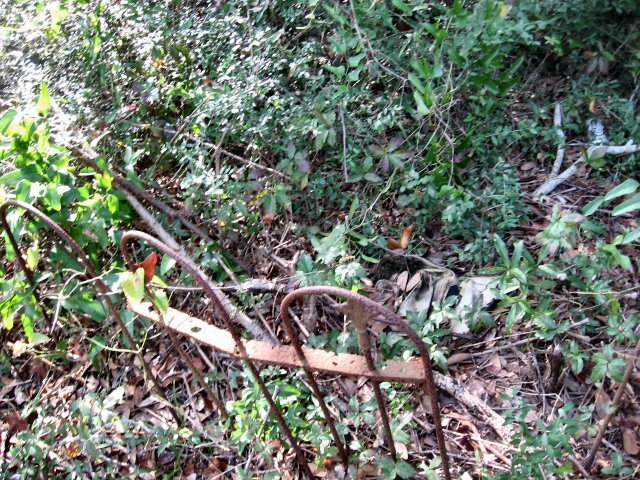 In recent years, the George Family Cemetery had become overgrown. James Hargis who bought several lots just east of the lone tombstone of Eunice A Ramsay kindly cleared the land and restored the fence. The Daily Herald, “Clifford George goes to Schenectady”, June 25, 1925, p. 3. The Daily Herald, , “Sarden (sic) George leaves”, September 1, 1926, p. 2. The Jackson County Times, “Sardin George, James Grimsly found drowned”, March 10, 1945.